The approach & yard trackage for South Station is quite complicated as it allows a train on any of the 10 approach tracks to stop at any of the 28 platforms in the station. In order to do this amazing feat, the yard has to have a bewildering array of crossings, crossovers, wye's, & slip switches. etc. In the very center of this puzzle is center diamond. The center diamond consists of 4 - 14 degree crossings arranged in a diamond pattern as you can see in the above photo. This diamond allowed trains to cross from one side of the yard to the other. The crossing also effectively split the yard in two; with platforms 1-14 serving one side of the yard, and the other side serving platforms 15-28. When creating the track design for South Station, it was logical to start at the diamond as the spacing between the tracks were at their closest to point to each other.It also sets how the 28 double-slip switches that radiate from the diamond will be placed. From there, everything else falls into place. This is the drawing I used to design the track plan for South Station. The drawing is the original 1898 plan of the yard trackage. If you look at the drawing, you will notice that everything radiates from the center diamonds. I scaled the drawing to the correct size (this drawing scale is way off) as I already had the plan of the track platforms to scale from another drawing. From there it was easy to determine scale as I had a known measurement (the platforms). In HO scale, the Yard, buildings, & streets translate to roughly to a scale plan of 11ft x 30ft in HO Scale. #6 Double Slips - 4ea. Large amounts of switches, such as the #6 turnouts, #8 Double-slips, #8 turnouts I am building using Fast Tracks. The rest will be handbuilt,Fast Tracks,, or Shinohara code 83 track. All of the connecting pieces, curves, etc will be either hand-laid (again using Fast Tracks) or Atlas Code 83 flex track. 34 Double Slips (#6 & #8s) = 136 Tortoise Switch Machines & 34 DS64s. 82 Turnouts = 82 Tortoise Switch Machines & 21 DS64s. 1 3-Way Turnout = 2 Tortoise Switch Machines & 1 DS64. Grand total = 220 Tortoise Switch Machines & 56 DS64s. As of today, I have exactly 44 Tortoise Switch Machines & 0 DS64s. So far I have purchased all of these jigs complete with the exception of the #6 Pointform Filing jig. When I purchased the #6 Turnout jig, I only bought the jig as I wanted to see if had the talent to actually build a turnout from scratch. It turns out that I actually enjoy building switches using Fast Tracks so I went ahead with the more expensive purchases. As the layout progresses, I will no doubt be buying more Fast Tracks jigs. Of course, there is the problem of trying to work (or play) on a layout that is 11 feet wide. The average arm reach is 3 feet so that leaves me with how to be able to reach the center of the yard without having to be suspended from wires above the yard. The work-around for this will be to construct the layout so that the buildings & street that surround the edge of the yard will be able to be removed & moved away from the tracks. In other words, the parts of the layout such as the head house, baggage, express & power buildings will be able moved complete with the substructure. If I plan correctly, I can reduce the reach from 11 feet down to 6 feet. But, in order to do this, I will need to build the benchwork so that it is removable along with the structures on top of it. Fortunately, a good friend of mine is a furniture maker who's shop is right over my layout space. He has agreed to help me work out the logistics of making the structures & benchwork removable in such a way as to not damage anything. This image of South Station, which is my inspiration for building my layout was taken from the top of the bridges in the first photo. So, if you were in the position of the photographer looking at the Station, all you need to do is turn around 180 degrees and you will be looking down the tracks on the 3 bridges in the first photo. The time difference is 6 years between the two photos but everything was still the same. The Bridges carried traffic from the New Haven Railroad's Old Colony line to South Station. They were designed to lift in order to allow boats to reach docks in South Bay Boston. Most of the docks in South Bay were used to offload Sugar & Fruits from points south. Domino & Paul Revere Sugar were located in this area. Starting around the early 1920's Boston & the New Haven Railroad began to fill-in South Bay in order to create more land to build on as Boston was expanding quite rapidly. 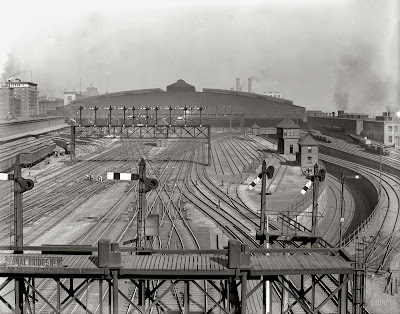 The New haven Railroad constructed a huge rail yard to handle passenger cars layed-over between assignments. Companies built Warehouses, Power Stations, & factories on the filled-in area. 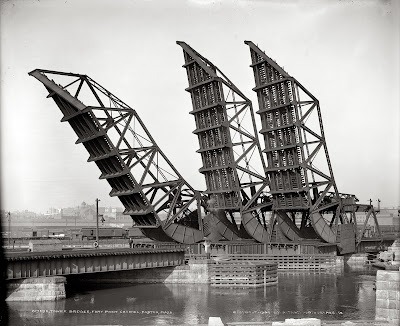 Eventually, the Bridges no longer need to be raised as there was no longer need for boat traffic to pass under them. In the top photo, the leftmost bridge was mostly used to carry coal to the power plant @ the Station. It was also supposed to be used for approaches to the never-used loop track under the station. 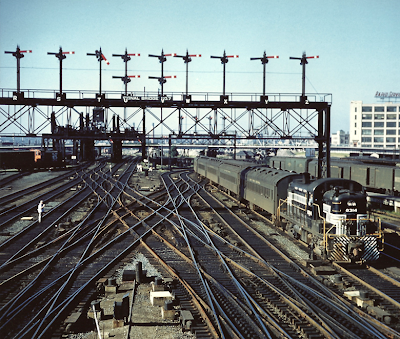 When the Power Plant was shut-down in the early 1950s, the tracks over the rightmost bridge were removed as there was no need for them as they serviced nothing. The Center Bridge & the Leftmost Bridge were used right up until the late 1990s when they were removed as part of the big dig project. The bridges were replaced with concrete deck bridges as part of the renewal. You can see a few parts of the bridge displayed in a small park located next to where they used to be located today.